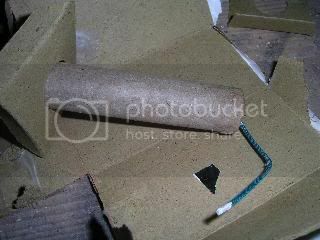 Not the flavoursome type though, but slightly dangerous pyro stuff that spits flames and sparks in all directions. This project does involve a degree of foolishness, so is done entirely at your own risk! 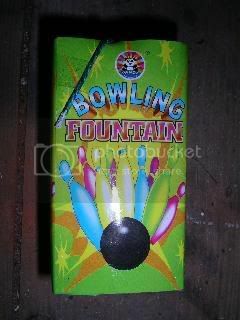 You start off by getting a cheap box of garden fireworks that contains a lot of fountains. 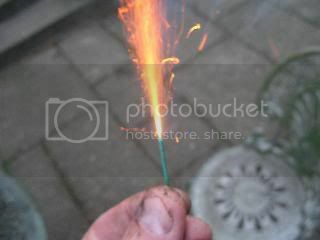 The fountain effect (called a gerb in the pyro industry) is ideal for this project since it contains a good mix of pyro compounds that crackle and produce coloured sparks. Try to avoid using excessively explosive items since they may blow an entire barbeques worth of hot coals into the faces of your buddies. If you do, then at the very least ensure it's caught on video for everyone else to laugh at. Here's a typical fountain. I really have no idea why this one is called a "bowling" fountain. The only thing in ten pin bowling that can create sparks of this magnitude is the pin-setter when you meddle with it's badly designed power cards. And this is what's inside. A lot of air and a very average looking tube style fountain. To access the goodies within you can carefully slit the thing open longways with a sharp knife. At this point it's worth mentioning that it is possible for pyrotechnic compounds to be ignited by the action of slicing through them with a metal blade so you should probably wear huge rubber chest waders tied tightly at the top, a leather blacksmiths apron, shoulder length welders gauntlets and a full face visor. Probably. 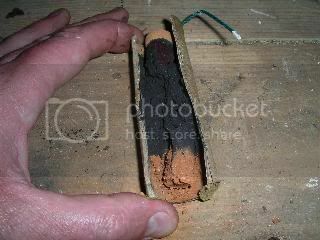 Once opened you will see the compound sandwiched between two plugs of clay, one of which has a hole to let the flames spray out as the device burns. 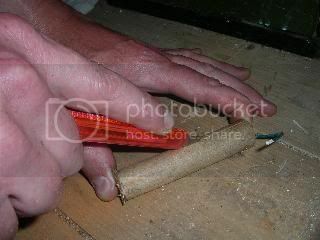 The pyro composition will be packed quite densely and this is so that it burns slowly due to the reduced surface area. If the tube contained loose powder it would be more inclined to explode due to the increased surface area of the loose material causing near instantaneous combustion. 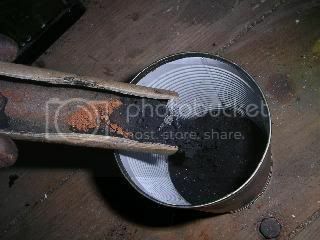 Lift out as much of the clay plugs as you can and pour the pyro compound into a handy tin. It doesn't matter if a bit of the clay goes in. Then open some more fireworks and pour them in too. The pyro compounds should not be stored for any length of time in the tin (more than a few days) as some chemical mixtures from different fountains can cause instability when mixed together and stored, with the risk of self ignition. As you're most likely to use it all in one evening that shouldn't be a problem. Keep the fuse (slow match) as it's fun too. Then, keeping the tin well away from the sparks and flames scoop some of the mixture on a bit of cardboard and sprinkle it on. 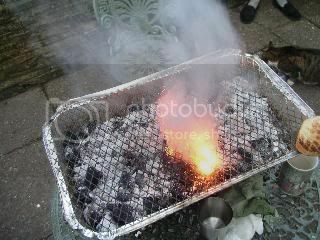 Don't do it when food is still being cooked as some pyro chemicals are best not eaten. The barbeque will errupt in a dazzling show of coloured sparks and flames with a very high possibility of sparks flying out into the bystanders. As such, eye protection should be worn at the very least, and it might be a good idea to encourage the wearing of old cotton and denim clothing to avoid combustion and minimise grief when someones shirt gets peppered with holes. 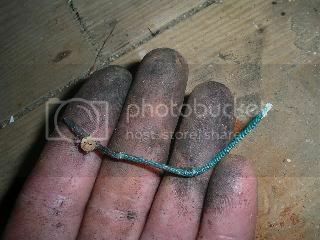 Then give everyone a bit of fuse and see who burns their fingers first. The nature of the fuse is that it sprays out quite a fierce jet of flame, so if dropped it will tend to whiz about on the ground a bit like a mini rocket.